Quick Take: The Big Bang Theory, "The Infestation Hypothesis"
(S0502) Tonight, we get a two-for-one dose of the Big Bang! Yay for hour-long special showsing of sitcoms we like! In this second of the two episodes aired, Penny has a new chair and it's great -- comfortable, a fabulous color that looks perfect in her house, spotlessly brand new-looking... and it comes off the curb. Sheldon flips out when he finds out that he's "been sitting in garbage" and goes on a crusade to get her to remove the chair. When she refuses, it's a fight. 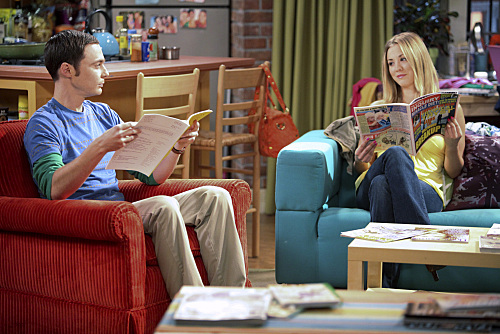 Sheldon looks to Amy to get her help and Penny calls her on it, which means Amy then freaks out over losing her only friend. She sits in the chair to prove that it's fine, and winds up proving Sheldon right -- there's something living in the seat cushions! Meanwhile, Leonard tries to spice up his online relationship with Priya by trying some cybersex, and he's really bad at it, there are numerous technical problems, and Howard's invention of a long-distance kissing machine results in him and Raj making out from across the room. This is one of those goofy episodes that make the series so delightful. All the emotional fallout of last season was resolved in the last episode, and this one can simply work on its own. And it's very straight forward, so the efforts of the writers can be focused on making the jokes the best they can be. The scene where Sheldon keeps knocking on the door with a new reason to get rid of the chair and Penny keeps answering with a new quip is just about the perfect level of absurdity that those two do so well. And Sheldon is proven right, but doesn't know it, which makes it even better. Leonard is as charmingly awkward as ever, but doesn't quite cross over into embarasment humor. It's close, but not quite. They try to be dirty and wind up being hopeless, and that's how Leonard is the best: a little lame, a little overly innocent, a lot in over his head. Still, it's a shame that chair had to go; it really was an awesome chair, and I could have seen it becoming almost a character in itself. A sort of running gag throughout the season, or a lingering mystery-joke... Maybe there's still hope? You can watch the whole episode on TV.com, because CBS likes to make me cry and doesn't post to Hulu.